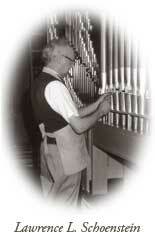 Schoenstein & Co. is the oldest and largest organ factory in the Western United States. The Schoenstein family has been building distinguished instruments for five generations. The firm started in the Black Forest of Germany in the mid-19th century with branches in Odessa, St. Petersburg, Berlin, and Stuttgart among others. In 1868, Felix F. Schoenstein came to San Francisco representing his father and brothers. By 1877 he established his independent firm—the most consistently steadfast and successful company in the history of organ building on the Pacific coast. The popularity of our American-Romantic tonal style and our reputation for integrity have widened our horizons to the entire nation and Canada.